Enter to Win a 5-day/4-night trip to Punta Cana for two! Airfare and round-trip transfers in Punta Cana included! Winner will be announced on April 7th at the Home & Garden Show, winner need not be present to win. Rules established by the Sponsoring Organization. SPONSORING ORGANIZATION: Alliance for Amesbury DBA Amesbury Chamber of Commerce. PURCHASER: Any person who satisfies the eligibility requirements and makes the required tender for participation in the raffle. ELIGIBILITY: Participants must be age eighteen (18) or older at the time of purchase of raffle ticket. No employee, or immediate family member of an employee of the Sponsor Organization shall be permitted to purchase tickets to the raffle or win a prize. ENTRY: The tender for entry into the raffle is Twenty Five Dollars ($25), payable in cash, by check, or credit card. A Purchaser must make the required tender and purchase a raffle ticket during the Raffle Period and prior to the drawing. The right portion of the ticket is retained by the Sponsoring Organization and the left portion is retained by the Purchaser. Any ticket purchased by check that is returned not paid will be withdrawn from the raffle. Raffle tickets may be purchased at Sponsoring Organization’s office at 5 Market Square, Amesbury, MA during regular business hours and at other locations listed on Sponsoring Organization’s website. Depositing the ticket or any material related to the raffle in the federal mail is a violation of federal law and may lead to criminal penalties. RAFFLE PERIOD: The Sponsoring Organization will conduct this raffle beginning on February 15, 2019 and culminating with the drawing on April 7, 2019. TICKETS: A maximum of four hundred (400) consecutively numbered raffle tickets are printed. The odds of winning may vary depending upon the total number of raffle tickets sold. Prize odds are based on 400 tickets sold. Sponsoring Organization will maintain a Master List containing the number one (1) to four hundred (400) inclusive. As a ticket is purchased, its number will be checked off the Master List. DRAWING: On the day of the drawing of the winning raffle tickets, each checked number from the Master List will be called and the corresponding ticket stub will be deposited in the drawing receptacle. A minimum number of one (1) ticket will be drawn by a third party designated by Sponsoring Organization and the name appearing on this ticket will be declared the actual winner. Participants need not be present to win. PRIZE: Prize is not redeemable for cash or credit. Alliance for Amesbury Inc. to pay up to $3,500 in travel arrangements. All travel arrangements are based on availability. Travel insurance is recommended and available at an additional cost to the winner. CLAIM DEADLINE: Winner must claim prize by April 30, 2019. In its sole discretion, Sponsoring Organization may extend the claim deadline. Failure of a winner to claim and accept a prize within the applicable time period may result in forfeiture of the prize. REDEEM: Trip must be redeemed by 1/1/2020 (based on availability and prices subject to change). PROMOTIONS: Sponsoring Organization reserves the right up to and including the time of the drawing to run contests in the raffle as a means of promoting tickets sales. The day of the drawing, additional raffles may be conducted for additional prizes. Winners of these additional raffles need not be present to win and claim prize(s). Claim deadline is April 30, 2019. CANCELLATION/POSTPONEMENT: Sponsoring Organization reserves the right to cancel this raffle and return all tenders upon its failure to sell 200 tickets by midnight April 1, 2019. Sponsoring Organization reserves the right to postpone the drawing date. In such an event, all purchasers will be notified by the Sponsoring Organization and given the chance to rescind their purchase. CONDUCT AND DECISIONS: By participating in the raffle, all Purchasers and winners agree to be bound by Sponsoring Organization’s resolution of any disputes. In the event of a dispute, Sponsoring Organization will appoint a panel of three persons who will, by a majority vote, decide resolution of the dispute. The panel’s decision shall be final and binding. GOVERNING LAW: This raffle is governed by the laws of the Commonwealth of Massachusetts. TAXES: Winners will be responsible for paying all taxes. The value of prizes will be treated as ordinary income to the winners for federal and state income tax purposes. The winners may be required to pre-pay a portion of the tax liability prior to receiving the prize. No portion of ticket price will qualify as a charitable contribution. 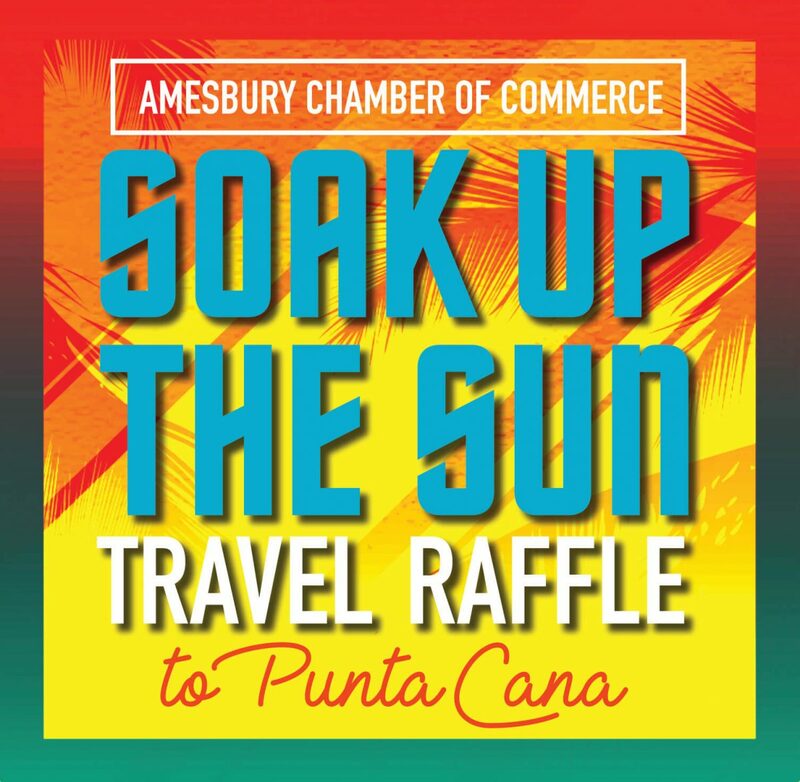 TERMS: Alliance for Amesbury Inc. is acting as an intermediary for suppliers in selling services or accepting reservations or bookings for services that are not directly supplied by Alliance for Amesbury Inc. as the organization holding the raffle, such as hotel accommodations, ground transportation, meals tours event tickets, airline tickets, cruises, etc. Alliance for Amesbury Inc. as the organization that held the raffle is not responsible for any injuries, damages or losses caused to any travelers in connection with terrorist activities, social or labor unrest, mechanical or construction difficulties, diseases, local laws, climatic conditions, abnormal conditions or developments or any other actions, omissions or conditions outside Alliance for Amesbury Inc.’s control. WAIVER OF RESPONSIBILITY AND LIABILITY: You specifically agree that Cruise & Travel Bargains International and it’s agents, owner and/or associated companies, will not be held responsible or liable in any way due to any detention, delay, loss or damage, sickness or injury, however or by whatsoever cause and of whatever kind occurring of or to you at any time. We act as agents for the principal companies supplying the travel services you purchase. In no event will our liability exceed that of refunding the amounts paid by you to us for your travel. If you do book travel with us, this means you specifically agree not to hold us liable for any thing, consequential or not, foreseeable or not.